A well-known set of steps in Cornwall is going to be easier to use at night after the handrails were fitted with state of the art lighting. 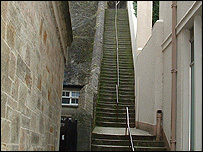 Jacob's Ladder is a flight of 111 granite steps in Falmouth built in the 1840s and is largely unlit. The old handrail is now being replaced with a new one with LED lighting strips on the underside. Cornwall County Council says it means the steps can now be lit without affecting the "unique" structure. The steps between the Moor and Vernon Place are named after Jacob Hamblen, the man who had them made. He was a builder, tallow chandler and property owner and had the steps built so he could move easily between his business at the bottom and some of his property at the top. "The focus of the scheme was to improve pedestrian access into the town by upgrading some of the narrow alleyways, using high quality materials to create uncluttered, attractive walkways which have a distinctive feel and can be identified as part of Falmouth," a council spokesperson said.